Five Kinver beers will be available at the Leicester Beer Festival to be held from Wednesday 12th to Sat 15th March 2014 at the popular venue of Charotar Patidar Damaj. Kinver Brewery have brewed a special festival ale for the event. Free admission to card carrying CAMRA members at all times. The 2014 festival theme commemorates the now defunct Royal Leicestershire Regiment, who were involved in the siege of Sevastopol during the Crimean War in the Ukraine. The regiment were also engaged in assaults on Kinburn and Redan, where Sergeant Philip Smith won the first Victoria Cross for the Regiment, awarded at the first ceremony in 1857. 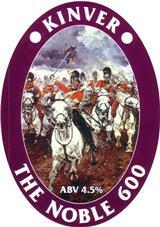 The Crimean war is famous for the charge of the Light Brigade, celebrated in The Noble 600 beer, and for the nurse, Florence Nightingale. It was the first war to use the newly invented railway, telegraph and photography. The Regiment was known as The Tigers, and was formed over 300 years ago in 1688. Many new regiments were formed in 1688 following the "Glorious Revolution" when James II was over thrown by William of Orange following the last successful invasion of England. The regiment served with distinction around the world until it was merged into The Royal Anglian Regiment in 1964. Golden Holden Ale is a hoppy ale brewed in memory of Andy Holden who passed away in Dudley in January 2014. Holden was an Olympian athlete who competed at the Munich Olympics in 1972. Holden won World cross-country gold in 1979, but subsequently took up marathon running to win three golds at Bermuda marathons and a gold at the Hong Kong marathon. He was a dentist by trade with a practice in Coseley, but had a passion for real ale, running 100 miles to drink 100 pints in just one week. Latterly, Andy Holden was a youth coach at Tipton Harriers.